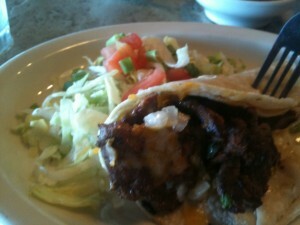 If you want to have a great lunch try this Taco. It is made with the leanest meat, grilled with your favorite spices. I used Ezekiel Tortillas and shredded cheese. For toppings you can add homemade salsa and sour cream. I made a small lettuce and tomato side. You could use this recipe in Phase 2 VLCD Simeons protocol if you remove the tortilla and put on a bed of lettuce with the steak and homemade salsa. I have been purchasing a great homemade salsa from the deli that is all natural and no additives and sugar free. Ezekial Tortilla would be a grain (starch), I thought you couldn’t have starches on P3? Just wondering if this was by mistake posted under p2 recipes. Just trying to understand why its listed there. You could use this recipe in Phase 2 protocol if you remove the tortilla and put on a bed of lettuce with the steak and homemade salsa.